Android Wear is a great extension of the Android platform on your phone. These devices, mostly smartwatches, can give you timely information on your wrist without ever having to touch your phone. That’s the promise we were all sold and for the most part, it’s true. The problem however is what you weren’t told when you picked up that Moto 360 or LG G watch: All those notifications will kill your battery life. Realistically, for most Android Wear devices, you are going to be pushing it to make it through the day on battery life and the more notifications you get, the more of a stretch it is going to be to make it through the end of the day. Fortunately there is a quick and easy way to stop the notification overload on your wrist and the beauty is you can do it from your Android phone or from your Android Wear device. In this How To I’ll show you how to quickly and easily block app notifications. The first thing to keep in mind is that for the most part, your Android Wear device is an extension of your Android Phone. That is, it is merely reflecting what is happening on your phone when it comes to notifications. If you get notified by an app on your phone, it’ll pop up on your smartwatch. With this in mind then, it makes sense that you block apps on your phone before they ever actually get to your Android Wear device. That is where the Android Wear app comes into play. The Android Wear App is a lot of different things for Android Wear devices. It is where you can quickly and easily change the watch face on your smartwatch, get suggestions for apps that are Android Wear compatible, adjust your tap actions and even chose which calendar events you get notified for on your watch. Buried in the Settings of this app is where we will go today. Tap on Settings (the gear icon in the upper right corner) and that will open up the settings page for the app. Halfway down the list you will see “Block app notifications”. Tap that and you will be greeted to a blank page with a big plus sign at the bottom. This is the list of all the apps that you have blocked notifications for on your Android Wear device and, by default, this will be blank. Once you are in the Block app notifications section, tap on the plus sign to add the app for which you want to block notifications. You will have to select them one at a time unfortunately you will have to do a lot of taps of the plus sign and the apps to get all the ones you want blocked. Once you are done, press back on your phone and from that point forward the notifications for those apps will not appear on your Android Wear device. 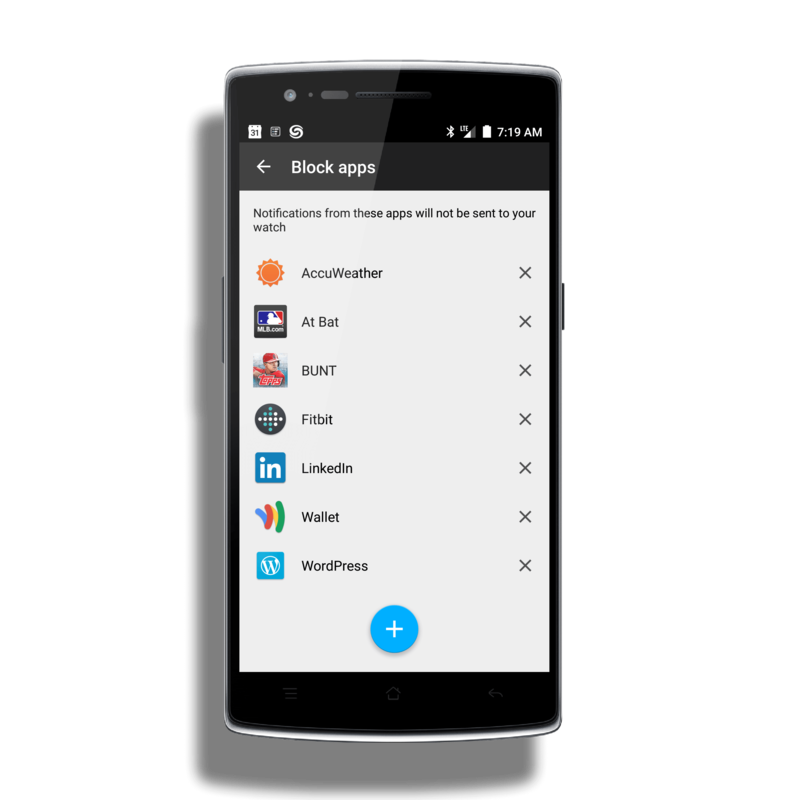 Which apps you should block notifications for is purely a personal choice. Obviously you probably don’t want to block things like Gmail or your work email account sending you notifications nor necessarily your calendar. But do you really need updates pushed to you from BUNT (the baseball trading card game – Yes, I know. I’m a baseball geek)? Chances are no. Likewise you may not necessarily want updates from LinkedIn or your favorite weather app. It’s entirely up to you but remember, the more you block the fewer notifications you will get which means longer battery life. The good news is that even though you have blocked a notification in the Android Wear app, the notification still appears on your Android phone. And if you change your mind and decide you do want notifications from a blocked app, just go to the Android Wear app, go back to Settings and Block app notifications and tap the X to remove that app from the block list. What if however you are on the go and you get notification on your Android Wear device that you don’t want to see any more. You can also block them straight from your wrist as well. To do this, swipe up to see the notification, then swipe right twice. You will see the option to Block app on your smartwatch. Tap that and it will be blocked from that point forward. You will also see this app in the block list in the Android Wear app the next time you start it up. With out getting non-essential notifications, your Android Wear device should have a much improved battery life. Hi. If you just want to control notifications instead of blocking you might try eNotify. It enables scenarios like: Only deliver the email notifications to my watch if it is from a VIP person between 8am and 10pm for example. That’s just one small sample. You can set-up as many rules as you need until you have complete control of your wrist again.